Have you been considering building a new home but don’t want to wait months before being able to move? This beautiful model home by Addilay Homes is now for sale with a closing date possible within weeks! 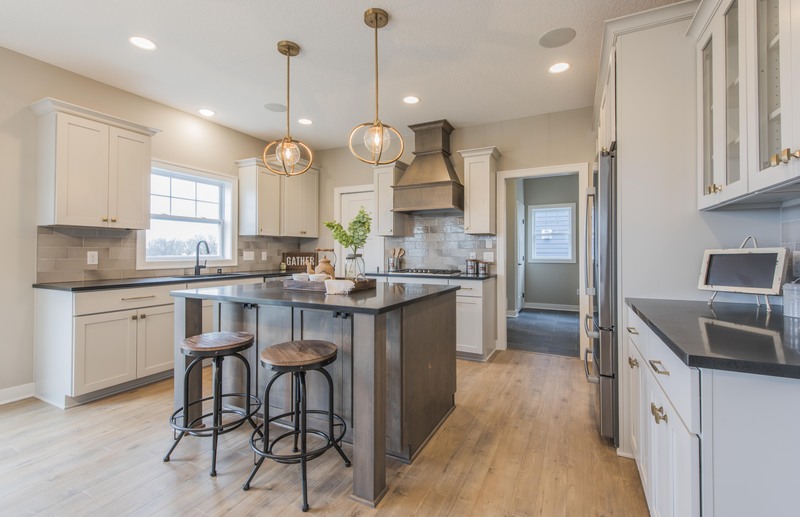 When you buy a model home, you not only are able to close quicker than building, you also get many upgrades that are not typically included in the price when you build. Our designer Christina created the palette for this home and it is simply stunning. Who wouldn’t want to whip up a meal in this gorgeous kitchen? Honed granite countertops, luxurious tile backsplash, Bosch appliance package, soft-close doors and drawers, a large walk-in pantry, and a beautiful vent hood over the cooktop make this kitchen a place that everyone will want to congregate in. Some other upgrades in this home are upgraded accent tiles in the master ensuite shower, coved ceiling in master bedroom, lawn irrigation system, LeGrand Smart Home Technology (control locks, temperature, lighting and more from your smart phone), built-in speakers in kitchen and living areas, upgraded flooring and cabinetry finish, upgraded Quartz countertops in main floor powder room and master bath, wallpaper accent wall in powder room, sculpted carpet in main floor study and much more. Interested in learning more about how to make this house YOUR home? Call/text any of the agents listed below.